The rise of voice technology is changing the way we search. We’ve all been at a meal where someone asks a question and no one knows the answer. People start to whip out their phones and search until they find what they're looking for. That's becoming the old way. Gartner estimated that 30 percent of our interactions with technology would be through voice assistants by the end of last year. Smart assistants are now in over 13 percent of homes. This change created a paradigm shift in the way we interact with information and by consequence, the way consumers interact with brands. The prevalence of digital assistants, mobile-friendly optimization and long-tail queries is facilitating the beginning of a new digital marketing era. We discussed voice technology in our 2019 SEO predictions blog post. Now we are going to take a deeper look at what the increasingly speedy adoption of voice technology means from an overall digital marketing perspective. According to a survey by PwC, “only 10 percent of surveyed respondents were not familiar with voice-enabled products and devices.” An overwhelming majority of those surveyed considered themselves to be familiar with voice technology. With familiarity comes adoption. And with adoption comes an exciting new medium businesses can leverage to communicate with consumers. The near-universal recognition and acceptance of this technology is earth-shattering — but let's put a monetary value behind it to demonstrate the potential scope of this market. A study by OC&C Strategy Consultants found that the existing market for voice-fueled commerce is around $2 billion. The industry is currently comprised of low dollar-value purchases like takeout meals, groceries and restaurant bookings. These purchases make sense. 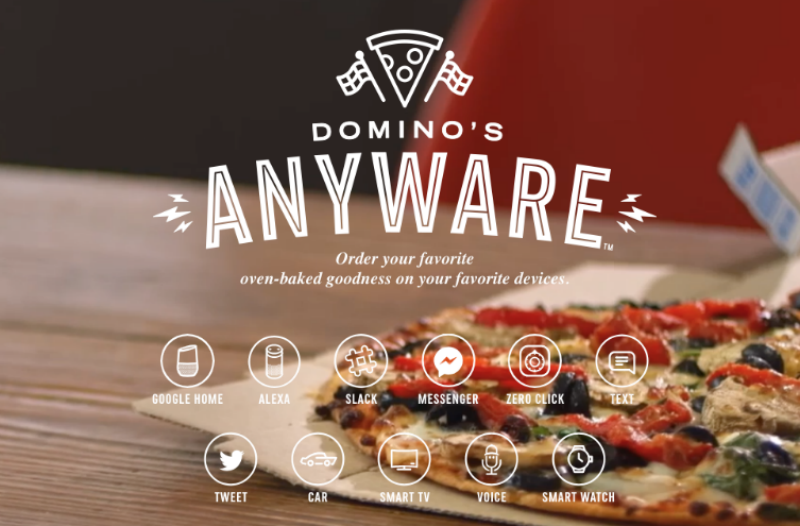 They are already deeply entrenched within the spectrum of online ordering. Spreading into voice technology was an easy next step. These types of purchases fall on the lower end of the price-point spectrum, where a user is more comfortable using this new technology without much of an investment in hardware. Where is the market going? Voice shopping is set to become a $40 billion industry by 2022, up 1,900 percent from the $2 billion it sits at today. That is astronomical growth that businesses can capitalize on in the coming years. What Can You Do Now to Optimize Your Digital Channels for Voice? Organizations can capitalize on voice command and search in pay-per-click advertising campaigns by adding search terms that match how people colloquially speak to voice assistants. Research long-tail voice queries and phrases that contain the five W’s: who, what, where, when and why. Additionally, businesses can prepare campaigns for success by including broad match modified terms to allow for the flexibility that spoken searches require. 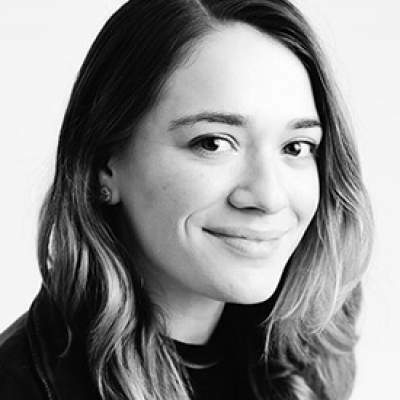 Kendal mentions that voice search can actually be used as a content tool itself. 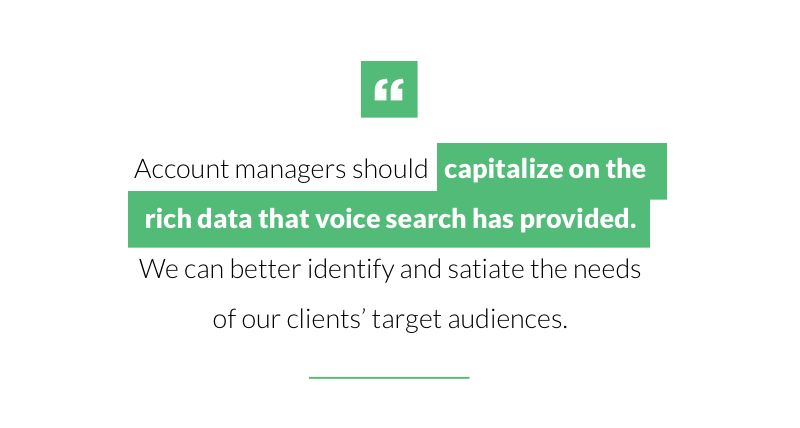 Voice searches can help to better identify the types of content that are delivered for specific queries and can influence the content strategy devised to meet those needs. Brands and organizations should strive to be the subject matter experts in their respective fields, so responding to a consumer’s pressing questions through voice is going to be extremely important. Businesses need to adapt their SEO strategies to match new online behavior and be prepared with keyword strategy research on how consumers are speaking. What Does the Future of Voice Look Like in the Digital Landscape? The future will inevitably be a pay-to-play landscape. Brands will promote themselves similar to PPC in order to be the first option read aloud by voice assistants. Amazon is currently working with brands to find natural fits for them within the realm of Alexa. Clorox is one of the companies reportedly in talks for major advertising deals. With Clorox winning the top bid, Alexa would then respond recommending a Clorox product and instructions on how to get the stain out. This is a perfect example of a relevant product placement that meets a user’s needs and satisfies their search. Finding moments like this where your brand, product, or service fits in will be crucial to properly leveraging this channel. When placing ads on these devices, specifically home assistants, brands need to tread lightly and remember they are putting themselves into a very personal and private space in a person’s life. Television ads are commonplace in the majority of homes, but a home assistant, unlike your TV, is always on. Having a home assistant constantly at the ready is part of the convenience factor. 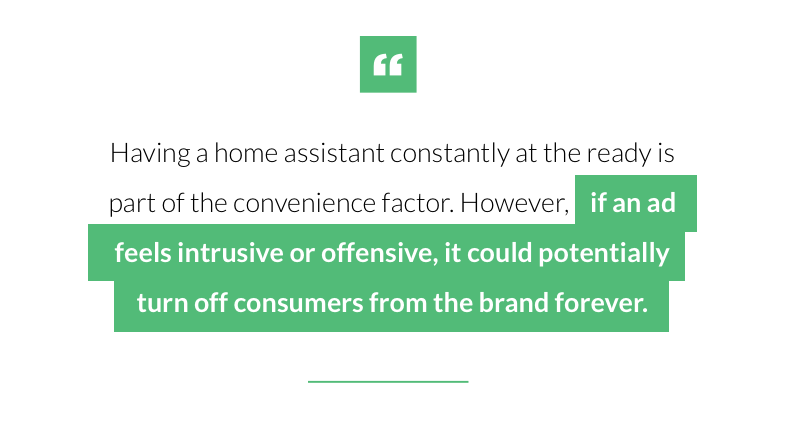 However, if the brand experience feels intrusive or offensive, it could turn off consumers forever. Additionally, this voice-activated technology increasingly entrenched in the home through smart appliances like the Kholer mirror that has Alexa embedded. This demonstrates the impact of voice technology in private spaces and underscores the need for advertisers to be tasteful. While having a delicate touch is important when advertising in these personal spaces, security is an even more significant risk factor when it comes to entering this market. Purchasing through voice technology has inherent risks because it requires very little authentication. Most home assistant owners already have a payment method saved within the system, so it’s relying on just your voice to approve the purchase. There are so many ways that can go wrong — like the story of Rocco the African Gray parrot ordering snacks for himself on his owner’s Alexa. Although this is a harmless and comical example, as Rocco’s order only amounted to about $3, the underlying implications are far more alarming. It exposes a gaping flaw in the security of the purchase system these home assistants use. Google’s software claims it can detect different voices, therefore creating some control over who has purchase access Amazon subsequently released this feature. However, there are still precautionary measures that need to be taken to enhance the sophistication of the security on these systems in order to break that barrier into the realm of high-value purchases. With the help of AI and natural language learning, these systems should eventually rise to meet that challenge. Looking at the size of the market and the exciting new advertising opportunities, it’s a given that brands have an interest in the world of voice technology. The key things to keep in mind when making that step is to choose advertising placements wisely where your products fit naturally, respect consumer privacy and carry out due diligence when it comes to purchase security.